Any middle- or high-school student in Cleburne ISD who is playing a school-sanctioned sport is welcome to come to our office to receive a free Shock Doctor mouthguard. This popular type of sportsguard provides robust basic protection against tooth damage and oral injuries. In fact, it is part of Shock Doctor’s mission to provide the best non-custom mouthguards for athletes, including those who wear braces or other oral appliances. For an even greater degree of protection, students may choose to receive a custom mouthguard for only $59. 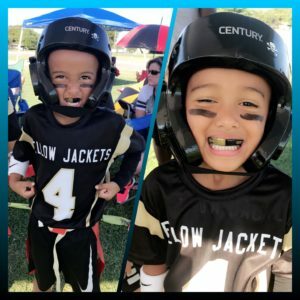 We design these pieces for each athlete’s unique mouth, which provides the most comfortable fit possible and minimizes the risk of oral injuries and concussions. As an added bonus, custom mouthguards look cool — they come in the school’s colors and have the school’s logo and the student’s last name on them. Football and other contact sports carry a greater risk of injury than other athletic activities, which is why everyone who plays such sports should wear a mouthguard during practices and games. However, it isn’t only athletes who engage in high-risk sports that should take steps to protect their teeth and lips. 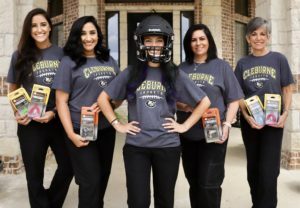 Accidents can happen in any sport, whether it is track, volleyball, baseball or other athletic endeavors; that’s why our mouthguard donation program is open to all of Cleburne ISD’s student athletes, not just the ones who play contact sports. This school year, we may end up donating as many as 1,000 mouthguards to local athletes — and we couldn’t be prouder of that fact! Dr. Hart, the leader of our practice and your skilled orthodontist in Cleburne, grew up playing sports; he is almost as passionate about athletics as he is about helping folks in the community enjoy straight, healthy teeth. Indeed, our entire team is enthusiastic about supporting local sports through our mouthguard donation program. If there is a young athlete in your family who will be hitting the court or field at Cleburne ISD this school year, please come in to take advantage of our free and discounted sportsguard offer. Dr. James A. Hart has been practicing orthodontics since 1978. His decades of experience have not dimmed his dedication to providing gentle, caring service to both adults and children who need orthodontic care. He strives to treat every patient like family. If you would like to learn more about our free mouthguard offer, or if you have any questions about what we do, contact our office at 817-645-2432.